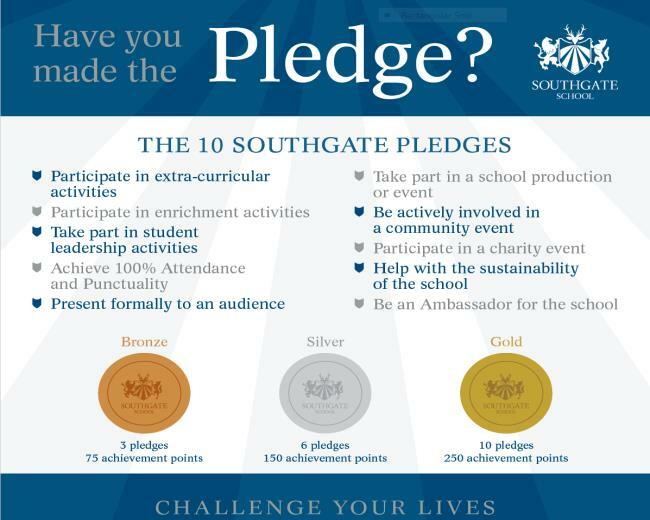 The Southgate School Pledge is integral to our vision of excellence and our rewards policy. Our aim is to foster a sense of pride and community. Our pledge affords all students the opportunity to demonstrate not only their commitment to academic success but to develop themselves as rounded individuals. We believe that young people are happier, more fulfilled and ultimately more successful if they engage in activities beyond the classroom and really make the most of what our school has to offer. Additionally, we offer an enrichment programme that allows students to excel in many ways. We are part of The Brilliant Club, an award-winning charity that aims to mobilise the PHD community to share its expertise with school so that more students from under-represented backgrounds are able to progress to highly selective universities. Through the Jack Petchey Achievement Award Programme, our students are able to nominate their peers who have shown commitment to the school through fundraising and participation in enrichment activities. Winners of the award are able to choose how to spend their prize money to benefit their school community.